I was first introduced to the Dunkin Donuts Vanilla Chai in the cold, cold Massachusetts winter of 2006…or possibly 2005. After moving out of the state, I struggled to find another Dunkin Donuts that had the Vanilla Chai (apparently it was optional/seasonal). Finally, last year, I found a local store that had the vanilla chai. It became a part of my weekend routine – walking to get my chai, and then walking home while sipping on this hot brew. Once I started a new job in the city, I found myself wanting a morning cup of something (I’m not a coffee drinker, which limits my options), but to my dismay there wasn’t a Dunkin Donuts nearby. So I started stopping by the Starbucks and picking up their version of the Vanilla Chai. Let me tell you, Starbucks Vanilla Chai tastes NOTHING like the Dunkin Donuts vanilla chai. But after a few months of Starbucks Vanilla Chais, I found myself looking forward to them in the mornings. 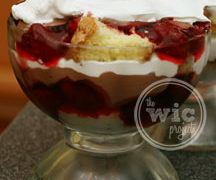 Now here’s my quandary – which is better? 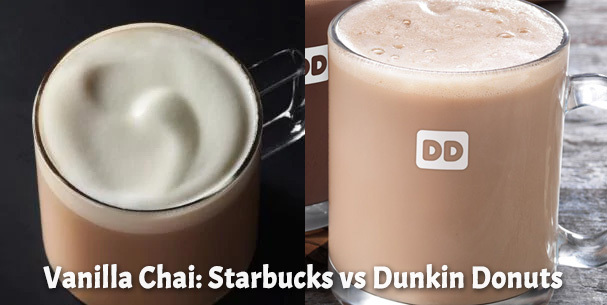 Starbucks Vanilla Chai vs. Dunkin Donuts Vanilla Chai? I’m finding it hard to choose. The Starbucks version feels “lighter” and has more of a kick to it. I definitely get a nice jolt of caffeine and the flavor doesn’t stay on your palette. The Dunkin Donuts version is creamier (the ingredients list shows it has non-dairy creamer in it), but it is also sweeter and the flavor lingers for quite awhile after the last sip. It’s perfect for a cold day when you’re going to hide under the cozy covers all weekend. Want to make Starbucks Vanilla Chai or Dunkin Donuts Vanilla Chai at home? 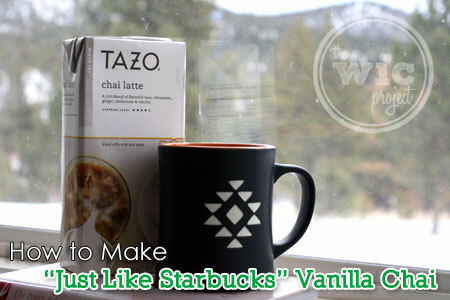 To make Starbucks Vanilla Chai at home, use our recipe for “Just Like Starbucks” Vanilla Chai which uses TAZO Chai Tea Latte Concentrate. How to make a “Just Like Starbucks” Vanilla Chai Tea Latte at home! The closest product we’ve found to replicate Dunkin Donuts Vanilla Chai is Big Train Vanilla Chai, which is a powdered mix. It’s available on Amazon. I recommend making the recipe with milk to get it most like the Dunkin Donuts version, but you can adjust the milk to water ratio to suit your tastes. Do you have a preference? Is there another version of Vanilla Chai that I just have to try? I love the vanilla chai at dunkin donuts but I never tried the Starbucks version. So far, the vanilla chai at dunkin donuts stays the same each time I go. However, I tried the chai tea latte at Starbucks and its a mixed bag. I guess it depends on who works there or something but the chai tea taste changes and it doesn’t taste as good as the chai tea latte. That I got at my school’s cafe which used the same taxi tea mix. I’m very skeptical when it comes to Starbucks now because if a school cafe can make better lattes then they are definitely not doing a good job of making great drinks. In addition, I can’t beat the price of Dunkin donuts. I can get a meal and a vanilla chai for five bucks when your running low on cash then that’s a steal. Not a Dunkin nearby? Where on God’s earth do you live? I have had nothing but bad experiences with Dd chai. I love Starbucks chia, but we only have a dd not a Starbucks. There is a Dunkin Donuts in the airport I regularly visit, and can I say that I have an enormous sweet tooth. So when I decided to get a little adventurous and try this new drink I had never seen before, oh boy. I think I have a new favorite tea flavor. Besides the sickeningly sweet flavor, it’s on my top list of tea’s. Almost as good as Pai Mu Tan, but they have to try harder to be that good. Try Panera…it’s very good! I would like to see this comparison also.